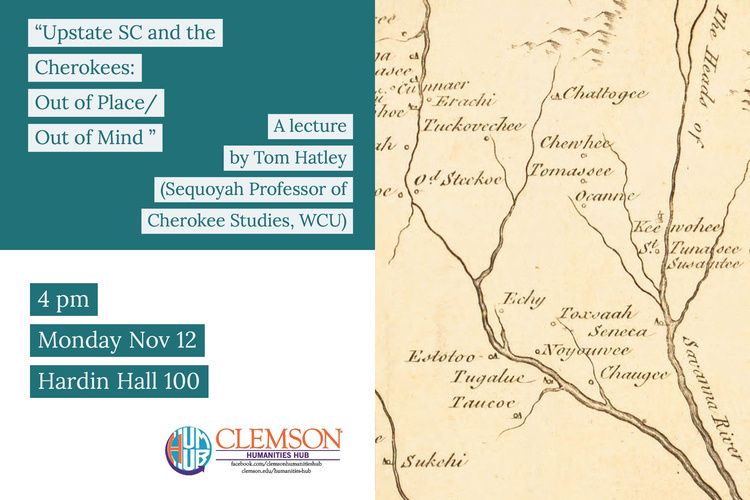 Tom Hatley: "Upstate SC and the Cherokees"
Tom Hatley will give a lecture entitled "Upstate SC and the Cherokees: Out of Place/Out of Mind" at 4pm on Monday, Nov 12. Hatley is former Sequoyah Distinguished Professor in Cherokee Studies at Western Carolina University (WCU). He is the author of The Dividing Paths: Cherokees and South Carolinians through the Era of Revolution (Oxford). He is also co-editor of the recently revised and expanded Powhatan’s Mantle: Indians in the Colonial South (Nebraska) and co-author of Uncertainty on a Himalayan Scale: An Institutional Theory of Environmental perception and a Proposal for Strategic Action (Ethnographia Press). An activist and scholar, Tom Hatley has played a vital role in developing important partnerships between WCU and the Eastern Band of Cherokee Indians: a memorandum of understanding between tribal and university leaders; an agreement to restore rivercane (a staple of Cherokee basketmakers); and expanding programs to prevent the loss of the Cherokee language.